You must have to do list or shopping list for daily life. Sometime you want to leave messages for family member or friends. Or your kids need writing and drawing board for scrawl and doodles. Instead of jotting things down on paper, how about trying this new gadget?-LCD Writing Board for RECYCLE USING. LCD Writing Board will prove "every penny worth". eWriter writing tablet's pressure-sensitive LCD writing surface creates lines of different thickness based on how hard you push - just like paper and pen. Why shall LCD Writing Board? How to replace the 3V Coin Battery? When the erasing function fails, please consider replacing the button cell. Warnning: Not for kids under 3 years old. Contain Small Parts. Warning choking hazard. ULTRA-BRIGHT COLOR: LCD writing surface is 50% brighter than previous models. Writing experience is comparable to pen on paper. Note: Writing color is Light Green, make sure if you would accept this color before ordering. POWERFUL LOCK FUNCTION: A Lock Key is available to save your ideas or drafts for a while. LOW POWER CONSUMPTION: Eco-friendly and reuseable Built in 3V replaceable coin battery (easy to replace), could write over 50000 times. 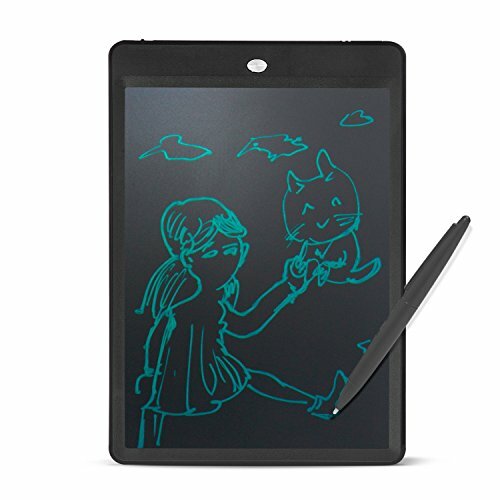 WHAT YOU GET: 1x 10" LCD Board (5mm thick), 1x Writing Stylus [weight 193g/6.80oz], 1xUser Manual; you could write with finger nails, but we recommend to write with stylus pen. If you have any questions about this product by ChalkArt, contact us by completing and submitting the form below. If you are looking for a specif part number, please include it with your message.